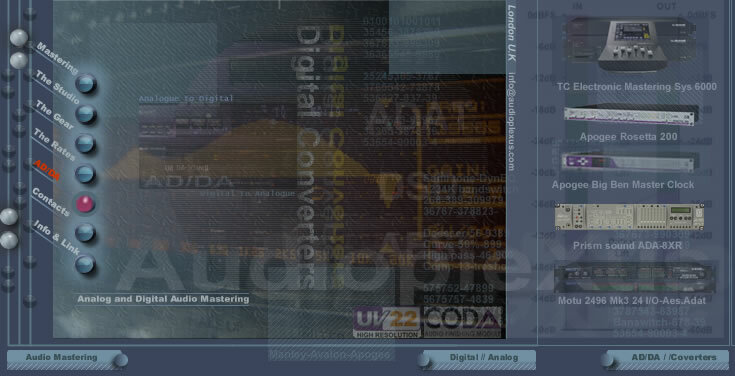 Mastering studi,AudiopleXus, State of the art audio mastering studio London UK. At the heart of any word clock regeneration is a phase lock loop (PLL). The PLL is a combination of analog and digital elements without the ability to dynamically adapt to the nature of the external clocks. In other words, the better the clock performance, the less flexibility it has. And conversely, the more flexibility there is in a PLL, the less effective it is at jitter reduction. Apogee’s new C777 is built to address these inadequacies. vState of the art mastering studio London-+44(0)20-8980-8947-Photo by Owen Davies-Design By AudiopleXus - info@audioplexus.com-Navcool group Plc © ® TM All Right Reserved 2004 2012.